My mother was born on February 13. She was not born on Friday the 13th, which you would think was a good thing, but alas she was born in Spain, and in Spain Wednesday the 13th is bad luck, which of course is when she was born. She is no longer with us, but she always liked the idea that she was born on the 13th; a superstitious woman she wasn’t. Friday February 13, 2009 proved to be a lucky day for me as finally, after many years, a true high speed internet service was installed at my house. I live in the country, and we don’t have cable or telephone DSL service, so for the past four years I have relied on satellite internet which is expensive, slower than DSL, and comes complete with a latency problem that means I couldn’t use a VOIP phone. On Friday a new wireless radio-based service was installed, and at the moment I’m getting download speeds of over 7,000 kbps (which won’t last, since there will be a limiter on it next week, to leave some bandwidth for my neighbours). Needless to say, I couldn’t be happier. It was a really cool Valentine’s Day present. Speaking of Valentine’s Day, I am very fortunate to be married to a woman who thinks Valentine’s Day is largely a silly holiday, designed mainly to separate men from their money, buying silly stuff for their wives/girlfriends that they don’t really want. We take a more practical approach: I start the day as I start every day: I make my wife a fresh pot of coffee. I’m a morning person and not much of a coffee drinker. She’s not a morning person and is addicted to the stuff, so my daily gift to her is that I make the pot of coffee. Happy Valentine’s Day. Of course I will also select a nice red this evening, probably a Chianti. And yes, we have now been married for 13 years, so 13 is proving to be a lucky number indeed. (For those who are interested, 13 is considered unlucky because, according to Wikipedia, in numerology, the number twelve is considered the number of completeness, as reflected in the twelve months of the year, twelve signs of the zodiac, twelve hours of the clock, twelve tribes of Israel, twelve Apostles of Jesus, twelve gods of Olympus, etc., whereas the number thirteen was considered irregular, transgressing this completeness. But I digress). Will 13 be lucky for the markets? The Dow made it’s low on Thursday November 20, 2008 at 7,552. 13 weeks later, on Thursday February 12, 2009, the Dow closed at 7,932, a gain over those 13 weeks of 5%. The optimists would say a bottom is in. A pessimist would tell you that’s still a drop of 43% from the 14,000 level reached in October, 2007. Last week I gave you a list of headlines showing all of the bad things happening in the economy. This week I could give a similar list, but the most important news item is probably that the Senate has now passed yet another stimulus bill. On Friday the 13th. Great. I firmly believe that government’s can’t create jobs. All they can do is tax the current generation, or borrow from future generations, and a multi-trillion dollar deficit this year will certainly qualify as borrowing from future generations. That may give a tiny little bump to the economy at some point in the next year, but it kills the economy longer term. 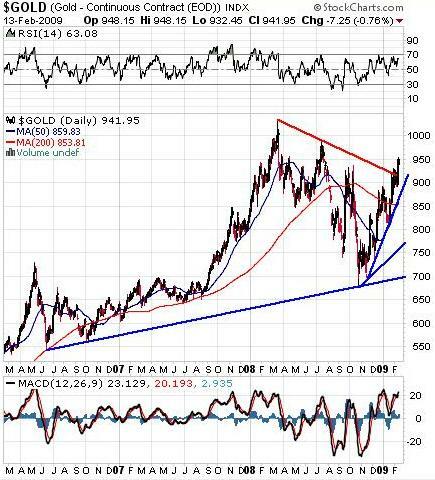 Which is probably why the gold chart appears to show a break out from the down trend line. 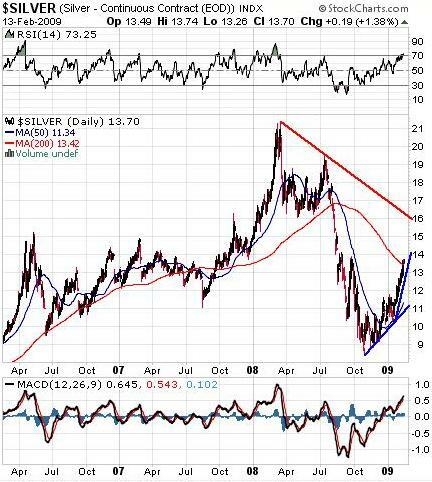 Interestingly, silver does not yet show the same break out. So, am I buying gold? Not quite yet. Over the last 13 weeks or so gold has had a run from $700 to $950; that’s a big move, and I expect some consolidation before the move resumes. (Actually, gold bottomed in October, then retested and held that bottom 13 weeks ago in November, so the gold bottom is looking more solid that the bottom in the general stock market). I will be patient. I will sit in cash until the market comes to me. I will not chase it. A further down turn in the general markets, which is very likely, is also very likely to bring all stocks down with it, including the gold and silver stocks. So I will not chase it. I have some small core holdings in the above stocks, which is my protection against an upside break out. For the rest, I will wait. And I will continue to wait, even it I have to wait another 13 weeks. Monday is a holiday in the U.S. (President’s Day) and in Ontario (Family Day) so all major stock markets will be closed; we shall see how the world develops over the long weekend, and we will probably be in for some pent up fun on Tuesday. Enjoy the holiday. We need it. See you next week.